This is the garden after a power gardening session that got as much as possible in the ground before the rain hit. We knew we didn’t have much time on Saturday morning to garden as the weather channels predicted a downpour of rain at some point in the afternoon. Mother Nature at her finest. We were actually able to get a lot accomplished before the first raindrops came down. Our garden probably doesn’t look any different to you than when you first saw our raised bed garden earlier this Spring. However, this time it is filled with seeds. 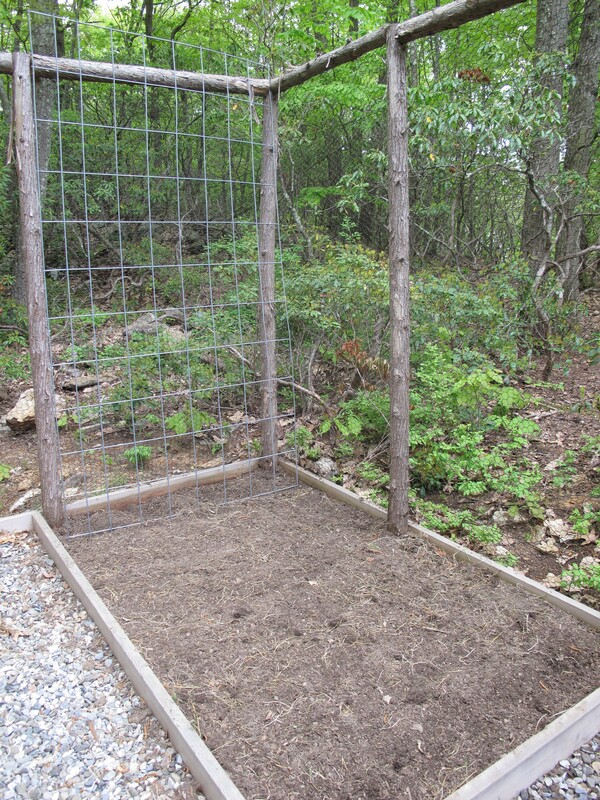 There are zucchini and cucumber seeds planted around the wire trellis in the back of the bed, followed by green beans, turnips, golden beets and red beets. All of these seeds got planted and covered and then the rain started. We’ll be honest. We didn’t exactly meet our goal. We had also wanted to get some live plants into the ground that were scheduled for planting this weekend. These were some of the plants that are growing under our grow light in the basement. Our eggplant, cabbage, cauliflower and brussels sprouts will have to wait. Darn rain…good for the newly seeded lawn; bad for the backyard vegetable garden. Take a few minutes to see our vegetable garden work this weekend and also see our gorgeous azalea bushes in full bloom. Here are our beautiful azalea bushes in full bloom. We have no idea how old the bushes are, but when they bloom, they are spectacular. Here is a close up of the azalea blooms. Their hot pink color is such a beauty. Green bean seeds all lined up and ready to grow. Another row….we like green beans on Glen Road. A solitary green bean seed ready for duty. All seeded and minutes before the rain came pouring down! Eggplant, cabbage, cauliflower and brussels sprouts will sit outside and get used to the weather because the rain prohibited their planting this weekend. So we didn’t get all of our gardening chores completed this weekend due to the weather. Good Old Mother Nature is the hardest part of gardening. You never know if she will be too cold, too hot, too wet. The odds are sometimes better in Las Vegas. Did the weather get in your way of a full weekend of gardening? This entry was posted in The Garden-2011 and tagged Acorns, Blog, Food, Fun, Gardening, Life, Love, My Life, Nature, Photos, Spring. Bookmark the permalink. Can’t wait to see how the garden turns out. That’s a great line up. Once I get my tomatoes and peppers in the real estate in my garden is somewhat limited. Hi Rufus’. I know how it goes with limited room. I have to make every inch of my garden count. I still have two beds that I can plant in. One for the cabbages, cauliflower, brussels sprouts and eggplant. The other for tomatoes. Then I have to sneak in a plant here and there until the garden is completely packed. We’ll keep everyone posted on how the garden keeps growing. Come back and visit soon. Oh and to answer your question. It was cool and dry here. Work got in the way of gardening this weekend. That darn work. It gets in they way too much, huh?! Winter is starting in South Africa. Nothing can beat the brilliance of azaleas. Hi gobetweenflames. Welcome to Acorns On Glen. Our azaleas are so beautiful. An instant pick me up if you are feeling a little down. Come back and visit soon.